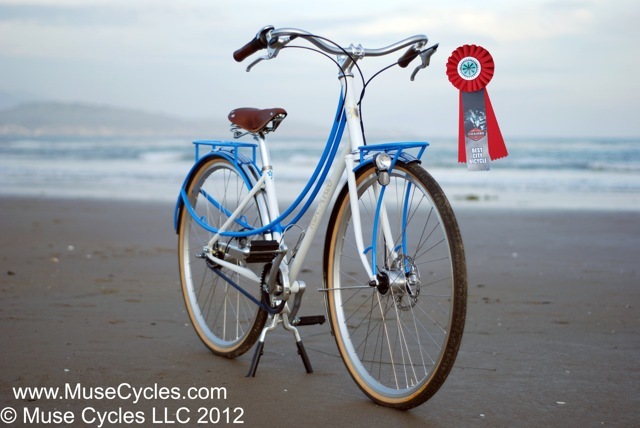 We came across Muse Cycles at the North American Handmade Bike Show back in March, where they won an award for Best City Bike. Here is an interview we did this week with owner/creator Lyle Harlow. 1.How long have you been building bikes? I have been building bikes for almost 3 years now. While this may sound like only a short while – I have been designing, building, welding, machining, and basically fabricating this and that for most of my adult life. 2. what is your favorite part about being a bike builder? something that is in its most basic form highly reliable transportation. While at the same time the owner is commissioning me to make their bicycle both unique in function, shape, and size as well as unique in artistic detail. I am an engineer at heart – As I mentioned earlier – I have been designing, building, fixing and improving things almost all my life. Some years ago – I was introduced to the concept / idea of FLOW (http://en.wikipedia.org/wiki/Flow_%28psychology%29). Basically to me it means that I become so involved in what I am doing that time passes without my knowledge, enjoying every moment. When I am building / designing bicycles – I often enter a state of flow – and at the end of the day – or at the day or at the end of the building process – I have a well designed and artistically unique form of transportation. 3. What are people’s reactions when you tell them you build bicycles? When I tell people I build bicycles – I typically get a couple of reactions. A. 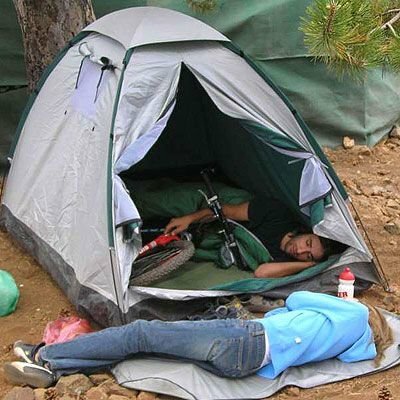 The glazed over eyes look – many people have no comprehension of what it means to build bicycles – and the mere mention of it makes their eyes glaze over, as the become disconnected with the conversation. B. Some people respond by asking why in the world I would bother to make something that they can buy readily made in a store – mass-produced in a factory over seas. C. A very small percentage of the people I talk to understand what I am saying and we end up having a very in-depth conversation about how I build bicycles. 4. What do they say when you tell them the price? The way people respond to the price has a lot to do with the how well they understand what exactly it means to build anything completely custom – whether it be furniture, footwear or a bicycle. If they have a good understanding of all the thought, labor, and time that goes into making anything custom, and particularly a custom bicycle – then often the reaction is positive. If however the person is of the mindset of why would I bother making something that is readily available and mass-produced then the reaction is often less than positive. 5. what type of riding do you like the best? My favorite type of riding is tight twisty groomed single track in the mountains or foothills. Preferably with some forest canopy, and rock outcroppings for views. I prefer to ride up and down (cross-country) as opposed to just up hill or just down hill. I grew up in the inter mountain west, and this kind of riding is very suited to the terrain found there. That being said – I also really like riding touring bikes on the paved/gravel/dirt roads of the inter mountain west also. 6. where do you get your inspiration for design? When I am designing a new bicycle – I try to strike a delicate balance between form (aesthetics) and function. Function is paramount – the bicycle is of questionable value to me and the end-user if it isn’t a very reliable lightweight machine for transportation. When it comes to aesthetics – I strive to achieve a finished product where the individual tubes that together make the structural support of the bicycle flow together. I strive to get the curves to complement one another and try to keep similar radius’ throughout. I am often inspired by the bicycles from early to mid 20th century – the Schiwnns, the Colsons the Elgins, the J.C. Higgins, the Roadmasters to name just a few. These bicycles often had very graceful lines – but were also very often very heavy, poorly equipped, and poorly built. 7. where did you learn how to weld? I learned how to weld while growing up in the rural ranch land of the southern Cascades of Southern Oregon and Northern California. Welding was a basic skill used to maintain, repair and fabricate ranch equipment, and I was exposed to it early and often while growing up. I was formally introduced / trained to weld and braze by my metal shop teacher in high school over 25 years ago. We learned Oxygen Acetylene welding, Oxygen Acetylene brazing, Stick arc welding (SMAW), and a little MIG welding or (GMAW). When I set about building bicycles – I leveraged my background with other welding techniques and taught my self how to TIG weld (GTAW) – as TIG welding allows the welder to be very precise with heat and weld penetration that is so necessary with the very thin-walled tubing used to manufacture bicycles. 8. what is on your IPOD right now? Lots of blue grass, folk, jam band, jazz. With music from Nickle Creek, The String Cheese Incident, Yonder Mountain, Hackensaw Boys, Dave Mathews, The Allman Brothers, CCR, John Coltrane, and so on. Some recent additions include Jack Johnson, and The Bare Naked Ladies. 9. what is your dream bicycle? My dream bicycle depends on where I am going in my dream. If I am grooving on some nice groomed single track – then its going to look something like a Rhythm 29er. I designed it to have a short wheelbase for responsiveness and compliant frame to liven up the ride and take out some of the punishment a spin on single track can dish out. Maintenance free Carbon Belt Drive transmission – so I can spend more time riding – and less time doing routine maintenance. If I am heading out to the farmers market then it is going to look a lot like a Harmony roadster. Integrated Front and rear racks, full fenders, big portuer style rack on front and panniers on back. Big double leg kickstand to keep it from falling over when loading / unloading the racks. Dynamo powered lights front and back – never worry about batteries again, and Gates Carbon Drive and Shimano Alfine internal hub. It’s all about getting there and back comfortably, safely and with a little style.If I am dreaming of an extended tour then its going to be a lighter weight version of a Harmony roadster with a more aerodynamic profile, and more emphasis on efficiency than on comfort. However – I am not in my 20’s any more so there will still be some emphasis on comfort! It will still have racks and fenders and lights! 10. How are you “cyclelogical”? I like to think I am cyclelogical in the following ways: When building my bicycle frames and complete bicycles – I try to utilize materials that are Made in the USA, or made by environmentally responsible companies abroad. I make every effort to recycle as much of the waste by-products from manufacturing as possible to lessen the environmental impact of my manufacturing process. I also utilize tried and true techniques in joinery and finishing that will enable my frames and bicycles to last many, many, many years. Most of all – I believe that we can live better, happier, more healthy lives if we embrace the bicycle as a form of everyday transportation. Of course there are barriers and road blocks to using a bicycle as a form of everyday transportation – but I feel most happy and healthy when I can ride my bike to and from work, school, market. Categories: bicycle, bike, commuting, cool products, Cyclelogical, cycling, Inspiration | Tags: american made, bicycle, bicycling, bike builder, city bike, cycling, frame builder, handmade, mountain biking, road bike | Permalink.